Lance Cpl. Ron Sullivan, bi-lateral above-knee amputee, poses with two Whitetail bucks he shot while hunting on Dos Hermanos Ranch here. Sullivan is currently assigned to Wounded Warrior Battalion East, Marine Detachment- Brooke Army Medical Center. The hunt was made possible by Combat Marine Outdoors, a non-profit organization with a mission to provide Dream Hunts and Outdoor Adventures for severely wounded Marines, Soldiers, Airmen, Sailors and Navy Corpsmen, according to the organization's website. The three-day event provided Sullivan and other wounded Marines and Marine veterans an opportunity to focus on their abilities and enjoy the hunting experience. Dec. 18, 2010 -- Lance Cpl. 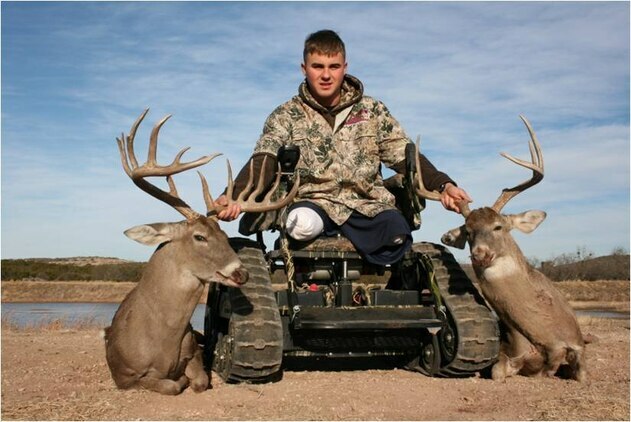 Ron Sullivan, bi-lateral above-knee amputee, poses with two Whitetail bucks he shot while hunting on Dos Hermanos Ranch here. Sullivan is currently assigned to Wounded Warrior Battalion East, Marine Detachment- Brooke Army Medical Center. The hunt was made possible by Combat Marine Outdoors, a non-profit organization with a mission "to provide Dream Hunts and Outdoor Adventures for severely wounded Marines, Soldiers, Airmen, Sailors and Navy Corpsmen," according to the organization's website. The three-day event provided Sullivan and other wounded Marines and Marine veterans an opportunity to focus on their abilities and enjoy the hunting experience.